A thesaurus with a difference. Find synonyms that are shared by two words, add the synonyms of another word and exclude the synonyms of another word. Find the synonym with the perfectly fine tuned meaning – or double meaning! Finally, a thesaurus that is not merely a list of synonyms. 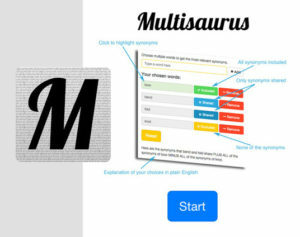 Multisaurus is a platform for discovering the connections between the synonyms of multiple words. Perfect for those who care about finding the right word – a dangerously useful tool for writers, journalists and academics. Go to multisuarus.com for the web version, or download the app today!